Figure 1 Examples of benthic algal succession from acute and chronic disturbances. (a) Disturbances such as floods or chemical spills can quickly remove viable algae from the stream. Once normal environmental conditions return, fast-growing r-strategist species flourish in a low-competition environment. Over time slower growing but more competitive K-strategist species accumulate and eventually dominate late successional assemblages. 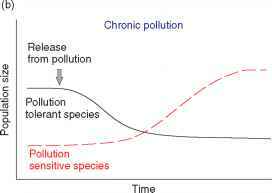 (b) Chronic pollution leads to a dominance of pollution-tolerant species with few to no sensitive species present. Reduction or alleviation of the pollution source allows a more natural assemblage to gradually return. 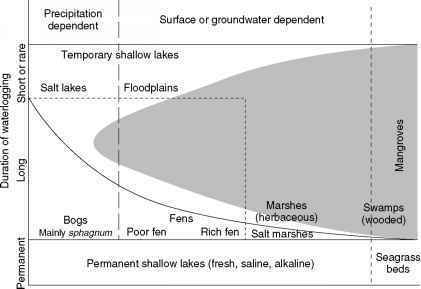 These general patterns can be applied to organisms at all trophic levels; however, population susceptibility to the disturbance and recovery time will vary among organisms. interactions can vary temporally and spatially as environ mental conditions in the ecosystem change. Alterations of a particular component, whether by pollution or by restoration actions, often have both positive and negative affects on other ecosystem components.